Wall strip 1220 mm. Used in the storage system Kenovo DuraTrax for mounting on a rail or wall mounting. In the guide can be inserted into the bracket (SHVBR1, SHVBR2) for mounting shelves; SHVWSA adapter for mounting baskets and hooks; sliding basket (SHVSB1, SHVSB2). Mounting on the rail (GSR1, GSR3, GSR6). Wall mount. Shelf 380 mm x 1841mm for storage Kenovo DuraTrax. Mounted in the bracket SHVBR1. Shelf 380 mm x 1216 mm for storage Kenovo DuraTrax. Mounted in the bracket SHVBR1. 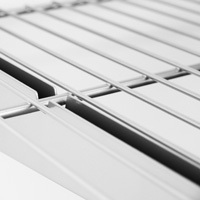 Shelf 380 mm x 666 mm for storage Kenovo DuraTrax. Mounted in the bracket SHVBR1. Shoe rack storage system Kenovo DuraTrax complete with fasteners. Read more about Shelves for shoes GSH26. Fixed rack for storing wheels. System Kenovo DuraTrax. Rack width 1000 mm. Depth of 700 mm. For wheels to R22 (the maximum wheel diameter 850 mm). On the wall without the use of rails. Sliding rack storage Kenovo DuraTrax storage of car wheels. Rack width 800mm-1250mm. Depth of 700 mm. Load up to 200 kg. For wheels to R22 (the maximum wheel diameter 850 mm). Mounting on the rail (GSR1, GSR3, GSR6). Read more about Rack GSH35.